So it’s no wonder they named their gorgeous jewellery enterprise Bowerhaus after these keen-eyed little birds! Inspired by all things vintage, Bowerhaus jewellery is known for its diverse, chic style and unusual materials sourced from all over the world. Strands of Keishi pearls, semi-precious stones, charms and sparkling crystals are just some of the objects you’ll find glittering across Bowerhaus’s collections, all with a playful, modern twist. The Clove Classic Earrings. Radiant and regal, the contrast of translucent baroque pearls and brilliant semi-precious quartz crystals is absolutely splendid, and makes for a lavish accessory. Each Clove earring features a unique baroque pearl, two of which are never the same, as well as a floral motif in sparkling colourless quartz that radiate rainbow hues. With The Clove Earrings, you’ll be the awe and envy of everyone you know. Treasure isn’t always hard to find – not with the beautiful creations of Bowerhaus. Setting and posts plated in eighteen carat white gold. 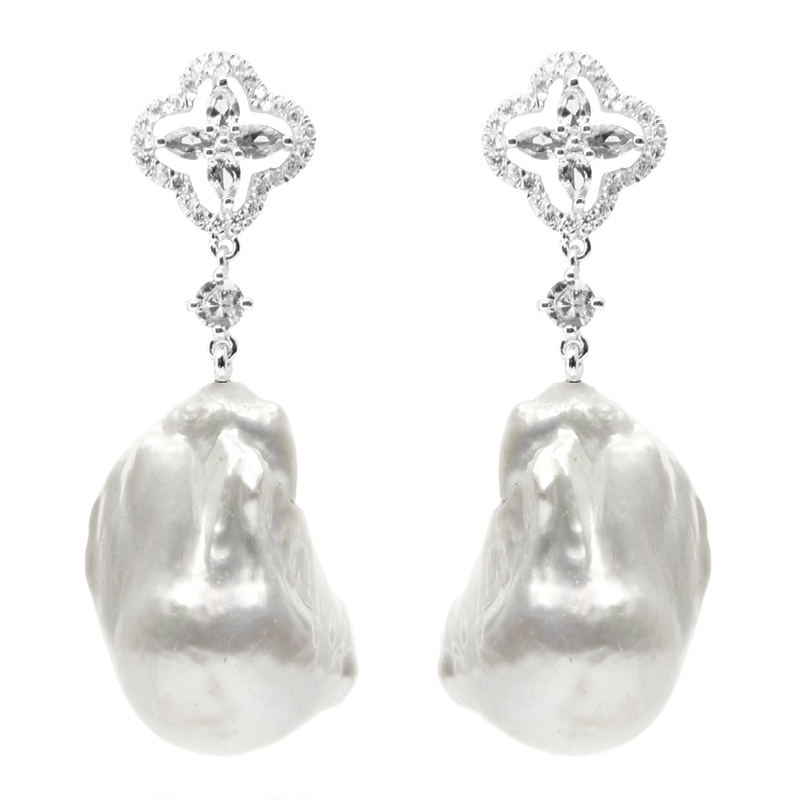 Crafted from baroque pearls, which never look exactly alike. A beautiful clover-shaped cluster of semi-precious quartz crystals. Gorgeously presented in a red velvet gift box. Earring Drop: 4cm (however due to the unique nature of Baroque pearls, your earrings may differ slightly in size).